The Serene Stamper: New Catalogue Launch Today! Hi Friends! I am soooo excited! The new 'Occasions' Catalogue from Stampin' Up! begins TODAY! Woo hoo! If you haven't already received your own copy of the catalogue you can view it online by clicking HERE. If you'd like a catalogue mailed to you (within Canada) let me know and I'll be happy to do that for you. The new stamps and accessories are awesome and you're going to love them! I have lots of great classes in store for you, using all the new products, so I hope you'll come and stamp with me and take some time out for fun! You can view my classes by clicking on the tab at the top of the page. New online classes and virtual clubs are also in the works and will be starting next week - all the details will be available for you then and I am truly excited about them. You asked for it and you got it! I'm thrilled that I will soon be able to provide this for those of you who live too far away to attend my classes in person. Here are some samples using new products from the Occassions Catalogue, just to whet your appetite! 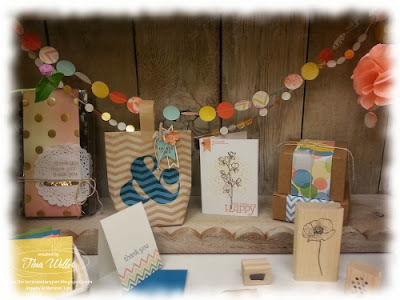 These samples were posted on "Stampin' Connection", a forum and fabulous resource, for Stampin' Up! demonstrators only (yet another perk of joining Stampin' Up!). Everything from the Occasions Catalogue is available beginning TODAY and you can shop online by clicking HERE. Don't forget to check out my upcoming classes and events by clicking the tab at the top of page - I wouldn't want you to miss out the fun!